The chapter is sponsoring a team for a second-straight year. 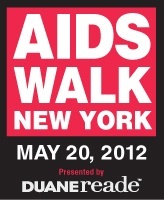 NEW YORK -- For the second-straight year, the Greater New York Chapter is participating AIDS Walk New York with a team taking the 6.2 mile walk for the 27th annual event on Sunday, May 20. AIDS Walk New York is the east coast’s first and the world’s largest AIDS fundraising event and one of the largest, most diverse, and highly anticipated annual events in New York City. Last year, 45,000 walkers and 2,500 volunteers raised $6.2 million for HIV/AIDS prevention, treatment, and advocacy programs. The 2012 event begins with walker sign-in at 8:30 a.m. with an opening ceremony at 9:15 a.m. The walk route, which weaves through Central Park, starts at 10 a.m. The UANYC team will meet in the lobby of the Time Warner Center (right in front of/above Whole Foods) at 8:30 and will pose for a group picture in front the elephant sculptures at Columbus Circle before walking over to the sign-in area. Please make sure to wear your best Alabama gear and comfortable walking shoes and bring your own water bottle. After the event, team members will gather at Jackson Hole Burgers for a celebratory brunch. For more information, contact UANYC Community Services Committee Chair Valencia Porter.